2000. 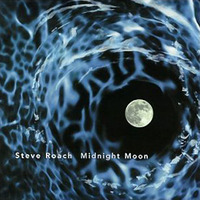 Ambient guitar experimentation from Steve Roach. "Tribal-ambient maestro Steve Roach leaves the percussion behind and returns to glorious stripped-down form on Midnight Moon. Closer in spirit to albums from the beginning of his career (notably 1984's Structures from Silence) and some of the early work of ambient pioneer Harold Budd, Moon sees Roach pick up a new instrument: the guitar. Not surprisingly, he wields it like a keyboard, weaving different sustained tones together to present something soothing yet just unsettling enough to make you pay attention. The instrument's lonely, gently foreboding sound undulates through the disc's 70-plus minutes, evoking a timeless desert landscape captured during the stillness of night. Along with The Magnificent Void, this is undeniably one of Roach's strongest pure-ambient recordings."